Beautifully engraved SPECIMEN certificate from the Joske Bros. Company. This historic document was printed by the American Banknote Company in 1927 and has an ornate border around it. 1867 � Julius Joske opened his first store in San Antonio TX. 1873 � Joske sold his store and returned to Berlin for his family. Joske returned later that year and opened a new store, J. Joskes and Sons. 1875 � Store moved to Alamo Plaza and the name was changed to Joske Bros.
1878 � Joske Bros. added a women�s apparel department. 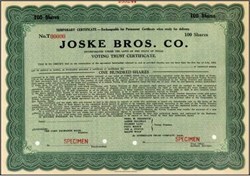 1887 � Joske Bros. moved to the corner of Alamo St. and Commerce St.
1903 � Alexander Joske purchased his father and brothers share of the company and became president. The name was changed to Joskes. 1909 � Store expanded again; new floors, elevators, delivery, and a customer service department were added. 1925 � Alexander Joske dies and son-in-law, Dr. Fredric Goldstein Oppenheimer, became president. 1929 � Hahn Department Stores bought Joskes. 1932 � Allied Store Corp. takes over and James Cavert became president. The rest of the Joskes block was bought, excluding St. Joseph�s Church. Parking is increased, store becomes first to be completely air-conditioned, escalators are introduced and over 100,000 sq. ft. is added. 1946 � Equivalent warehouse space is added. 1953 � Store size is doubled to over 551,000 sq. ft. and parking added up to over 20 acres. 1950�s � Chain is made by adding stores in North Star, Las Palamas, and a Joskes in Austin. 1986 � Campeau Corp. of Toronto purchases Allied. 1987 � Dillards takes over Campaeu and Joskes is now Dillards.